Bobby Hecksher is back with his Warlocks and this time it's on Tee Pee Records and with producer Rod Cervera manning the controls. The result is a dark, dark piece of noisy trajectory. The drums are buried in the back as well as Bobbys nasal vocals. Everything was recorded in just a few weeks quite contrary to the previous efforts that had very long production times. It's a heavy piece of paranoid music but on the same time it's very beautiful. 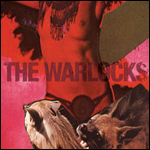 Warlocks are constantly compared to Velvet Underground and other late 60's psychedelic bands, but it's much more than just that. Opening track "The Valley of Death" lays the ground for the record as a whole. The slow repetitative guitar builds up with the rhythm section moving in slow motion and during the end everything is drowned in noise and you has to see if your speakers are blown because of the muddy mix. It's a hard record to absorb and digest completely, but it's worth the effort.